We spent the whole day writing our final blog post and saying good bye and thank you to all our supporters. At blacklane we had a meetup with interested people from the IT department and presented our achievements together with Team Ruby'n'Bugs. It was a great time - mission accomplished! Maren was on a conference in Munich, called Bits and Pretzels. There were some nice talks from start-up founders and their success stories and failures. Recruiting developers seems also to be a big issue in that community ;) During networking Maren met some nice people that were interested in speakerinnen.org and diversity in tech. During the long time in the train she read in her book "Rails 4 test prescritptions". Julia presented the Diaspora project together with our mentor Lisa at Open Source bash. Besides she started writing our final blog post. We both prepared the last parts of our presentation for the wrap up in the evening. Then Julia was on JS conf and Maren was reading in her Ruby-Book about deployment, eval methods and Rails. In the evening we enjoyed the wrap up and seeing so many familiar faces. It was great meeting our supervisor Verena in person. Team Delta Quadrant is suuuuuuuper busy this last few days. It's wwwtf aka what the fest aka web tech fest in berlin and there are so many conferences and workshops happening. So on Wednesday Julia had to oversee a workshop she organized! The very very first NodeBots Event in Berlin ever! it was amazing! Also Maren worked on the Wrap Up Party Presentation. Today was all about the future .. what will be coming next for Julia after her amazing RGSoC Experience. She also spent some time organizing the first ever NodeBots Event in Berlin (happening on Wednesday). Tonight Julia will be coaching at a Nodeschool Event again! So we are still struggling with one change that makes the code much more DRY but requires changes in multiple classes. Then we made pull request and got some feedback for improvements (part of the feedback was, that we probably don't need that very cool regular expression - argh). In the afternoon Julia had a job interview (Yay!) and Maren read about databases in the Ruby book and worked a little bit on speakerinnen.org. We worked remotely because we were both feeling a little bit sick. We made some progress with the tests. But it is not so easy to create the objects in the test environment we need to test our new formatting method. Probably we should learn more about mocking. Also Maren read in the "Beginning Ruby" book about documentation, error handling, debugging, testing and benchmarking. Julia read about clojure in her new "7 languages in 7 weeks" book. We also ordered new books: "7 more languages in 7 weeks", "97 Things Every Programmer Should Know", "Rails 4 Test Prescriptions: Build a Healthy Codebase". We worked on the diaspora export to tumblr and added the hyperlinking of the tags. Then we started writing tests for these new formats. You never can learn enough about Regex so we decided to follow another tutorial from nodeschool. And then we had that idea during a lunch talk to help refugees (and helpers) gathering information about educational resources and the access to it aka computers and WIFI. So we (together with Thuy of team Ruby'nBugs) started brainstorming and building a small website based on Google Docs and tabletop.js which provides an infrastructure for crowdsourcing information and searching it. In the late afternoon we had a skype call with our supervisor. In the evening, Maren attended the Rubymonsters Learning Group and Julia coached at a nodeschool event. Then we learned about Regular Expressions and worked through this tutorial. Besides we went with Christophe through the process of updating his diaspora pod to the newest release. The last days of our work on the map implementation started (hopefully). We did some more small changes and edited the name of the Pull Request from [WIP] 5813 show geolocation on osm into 5813 show geolocation on osm -> WIP = work in progress is gone. Yay! We then worked on the export to tumblr and managed to convert every @mention into a link to the diaspora profile. We spent some time with learning more about git. What is really the content of one commit? What is the difference between merging and rebasing? We had a skype call on this topic with our coach Andy and afterwards went through the first chapters of this git tutorial. Besides we refactored our code of our second large and open pull request on displaying maps. We finally got the ok to use the map tiles of the Heidelberg University! Hopefully the PR gets merged soon (because we spent again a lot of time rebasing it to the current develop branch). Julia booked her flights to Euruko in Salzburg! Yay! * we tried again to merge Team Techylite's Pull Request on speakerinnen.org. This time with the Github Desktop version. It kind of worked merging it but two things were crazy: the merging person was the author of the code and the app didn't work anymore. So we did a hard reset. New plan: Team Techylite makes a new pull request. Yay! Finally our first major Pull Request was merged into the project. With the next release podmins can create moderators to help working on reported posts and comments. Btw: did you know that your Github activity diagram only counts your activity when all your work is merged into the default branches of the project? We also wrote a reminder email to the university of Heidelberg to get the go for using their maptiles. This would make our second open pull request ready to merge. Besides we worked on prettifying the diaspora output to tumblr. Our focus was to convert every @mention into a link to the diaspora profile. Therefore we read all the code related to the export to tumblr and extracted the necessary information to compose the link . 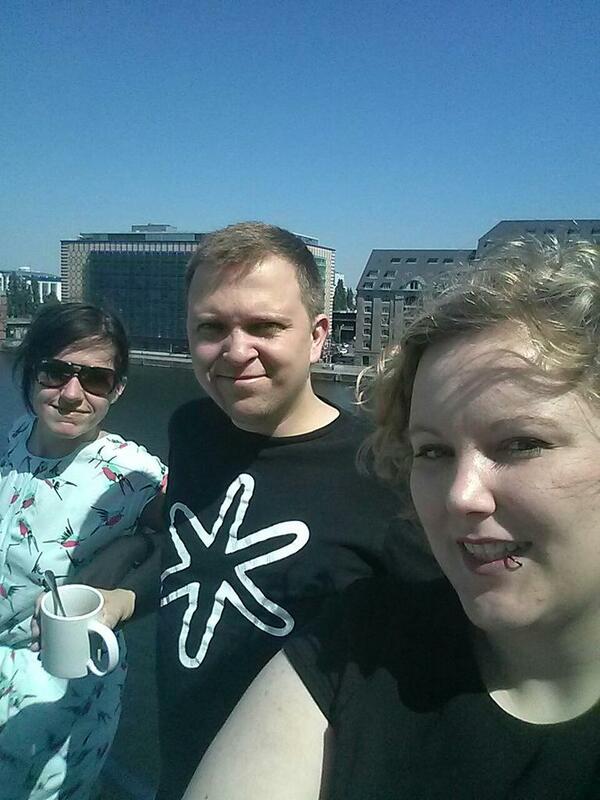 A very nice thing today: Team Ruby'n'Bugs moved in the blacklane office. Yay! We didn't get any further with the chunking issue (but we got some feedback of the person who opened that issue a year ago - and probably he can have a look on it again on the weekend). So we decided to investigate another issue we are interested in: working on the outbound sharing to tumblr. We did some research on the tumblr API, on the code that already exists in diaspora to share with third party services and the structure of the objects that are currently exchanged. Here we put together the important information. In the afternoon, Maren had a radio interview on speakerinnen.org. We spent the whole day with smoking heads (do you say that in english?) and doing more research on the implementation of chunking for picture upload together with our coach Christophe. Apparently there is a big need to handle big file uploads with possibly slow internet connections. But apparently the need and the discussion in the Rails community is not so urgent. We found only a few gems that are not well maintained. Did we miss something? We tried to reach out via the slack helpdesk, the diaspora community and via twitter to find someone who already worked with chunking. Probably we'll get some more inspirations and experiences until tomorrow. Another agenda highlight: this evening we will meet our coach Andy. We refactored some code in our feature to add a new moderator role and wrote some more specs. Besides we started our research concerning our third big issue we want to work on: to use chunking for uploading photos. A day full of reading in the Beginning Ruby Book and recap basic ruby concepts and methods. Also reading about Active Record Associations as homework for the Rubymonsters learning group in the evening. In the evening Maren also reviewed Team Techylites' Pull Request on speakerinnen.org. After the great day off we were at first a little bit hangoverish but got into work pretty fast. Yay! We got the perfect solution for our jasmine test problems and fixed the tests. Besides we rebased our map pull request which was pretty annoying since many things changed during the last weeks. We gave us 20 min to make another research on the jasmine test problems - with no success. Then we decided to ask some other diaspora developer for help. After that we worked on our other issue to create a moderator role. There we had to solve the problem that a notification email should been sent to multiple recipients. It was no problem to send one email to multiple recipients but it was more complicated to send the same email separately to multiple recipients (which is necessary because people might have different language settings). After a while we managed to accomplish that task but without actually getting different languages. We worked on the moderator role and dive more deeply into Rails now. We created a new moderator role and make it accessible for certain methods. Here we had to learn that there is no possibility to chain before_filters which would have been helpful to filter if the current user is a moderators OR an admin. But we also learned that some restrictions to Rails are well-thought-out and probably our concept of creating the moderator role isn't as well-thought-out. We hope to have found a good concept - at least it works! Right now the moderator can see, destroy and mark reported comments as read. We also tried to solve a problem with our map implementation. There seems to be a bug in Chrome (only in Maren's Chrome) which prevents the map to enlarge via click. Through debugging we found out that Maren's Chrome renders a div with a height of 76px instead of 75px which is our selection criteria. With the help of our coaches we learned that it might be a problem with the rounding rules of the browser. Humpf! It would be better to use another class instead of an exact value as a selection criteria. Besides we saw Steve Klabnik's talk on "Rust for Rubyists" for lunch at blacklane. Covered the possibility that some podmins (Diaspora Pod Admin) will not get map box (or other tileserver) credentials. The Map and it's related functions will now only be executed when the map feature was enabled by the podmin. We startet with our next issue, "creating the role of a moderator". Currently we are developing TDD Style which really helps, deep diving in the rails structure! We could solve one problem concerning the Jasmine test issues but got stuck on another one. Then we changed the implementation of the map in the single post. There the map is now always visible as a small map and expands while clicking on it. This needed some more understanding of the tile loading and some trial and error but now we got it work. Besides we moved the mapox credentials to another place where the podmins can enable the map function and store their access token safely. Moreover we renamed a bunch of files tidy up the use of the expression "location" in the whole project. We have been at Chaos Communication Camp (#CCCamp) and it was amazing! We were part of Open Code Town which organized workshops like Sketchnotes, Rust for beginners and advanced, Rails Girls, NodeSchool, Nodebot, a MaidSafe talk and a few meetups. We both were coaching at the Rails Girls workshop and Julia also at NodeSchool. Maren hosted a workshop on speakerinnen.org together with Anne & Anja. Besides we got to know some core developers of diaspora and attended a diaspora meetup with users, podmins and developers. We learned more about decision making in the community, the history and current big development projects. Last but not least we had much fun with coding new projects, soldering, experimenting with the rad1o, solargraphie, crocheting, meeting and hanging out with interesting people, swimming and great talks about data, women in tech, artificial intelligence. Today we learned more about Google Chrome developer tools with this tutorial from Codeschool. It wasn't so much fun because the tutorial was a little bit outdated and it sometimes worked better in Safari, than in Chrome (!). But nevertheless we learned many things about the possibilities of these tools. Then we used this new knowledge to work again on our map implementation and get in on a width of 100% in a special view. 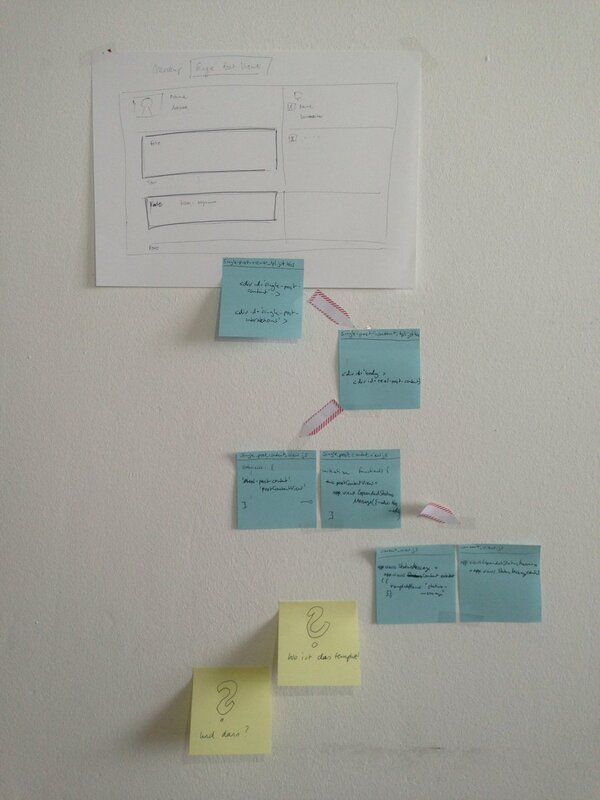 This was a little bit of work because we are in the context of the bootstrap grid system but we finally worked it out. Still hot, still struggling with Jasmine tests but thanks to the help of a diaspora core dev in the IRC chat we managed to write several tests and make it PASSSSS! We decided to make a pause working on our new issue of autosuggestion as Julia recognized that another contributor is currently changing the libraries that handle autocompletion and autosuggestion. Learning: it is a good thing to have an eye on the other contributions in a big project (e.g. via watching the repository on github). There was some feedback on our map implementation. One of them was to merge all location data (address and coordinates) into one object. That was what we did today. Besides we decided to work on a new issue that not part of our plan but that annoyed Julia as a diaspora user: auto suggestion of tags inside a status message. We started working on that issue but realized in the evening that currently another contributor is replacing the library diaspora is using for these suggestion things. Thus we decided to leave working on the issue until the other pull request is merged. Maren had a mentor's call with Team Techlyte. In the evening Julia was at her Rubycorns learners group meeting. We had a really great weekend at eurucamp with lot's of nice and interesting people and talks. It was amazing to meet so many other people who are involved in Summer of Code (students, coaches, mentors and organizers)! After all this input we decided to take a day off on monday - ouff! Day 22 - Rails Girls rule! 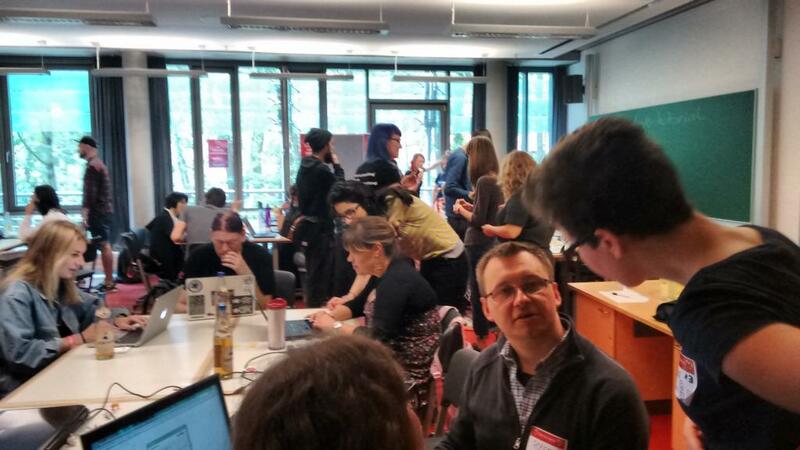 The Rails Girls workshop at eurucamp was a blast! It was a great pleasure for us to give the introductory talk and coach a group of beginners. Our day was very much about preparing our presentation tomorrow at the Rails Girls workshop at eurucamp. Besides we worked on improving our map implementation on diaspora. This evening we will meet our coach Andy and ask him about gem integration, git amend and changes on db:schema. Today we discussed our map implementation with some diaspora core developers and already implemented some changes. Furthermore we outsourced our map in an own subview. For lunch we met Nynne & Franzi from Team Rubyherzilein which was fun! Now we are sitting at St. Oberholz working on our talk for the Rails Girls workshop on friday. There are still some open questions we hope to get solved with the help of some core contributors soon. - we squashed many commits to provide a more compact pull request and struggled with some issues while rebasing and squashing. We think about using git amend more often in the future to avoid so many squashings in the end. Probably we should discuss that with our coaches. Our 2 Pull Requests have made it into the new Diaspora Release last night! YAY!!! We finally managed to get the location displayed on a map AND set a marker on the correct position! With the help of nice developers at blacklane and on the diaspora-dev-chat we could solve our last problems with the rails asset pipeline and leaflet.js. We worked on our map implementation and solved many issues along the way. So after a while the map was really displayed. While refactoring and bringing the code in a proper order everything crashed again but we finally could get it run with the help of our mentor Lisa. * refactored the huge specs replacing the old ruby hash syntax and replace instance variables in before blocks into let statements which took us longer than expected. Big learning: when refactoring tests do that incrementally and let run every describe block or even every example right after the refactoring. So it's easier to find possible errors. That was our first day where we didn't work together because of two appointments during the day and such big distances in Berlin. This was a good time for Julia to learn more about Rails and talk to our coach Christophe about what we built recently. And for Maren to learn more about RSpec in the book "Rails 4 Test Prescriptions". Yay, we had a great start into the week because we could solve all our remaining problems. We met our coach Bastian who gave us an overview of backbone.js which helped us a lot to understand where to get our data and where to put our code. Besides we learned how to squash commits and had a short catch up with our supervisor. Everything is fine! Today we were still struggling with the right places to put our code to render a map. We are quite confused about what all the frameworks (Rails and backbone) are actually doing with the already existing coordinates. Besides we gave a little talk to some blacklane developers who were interested in what we are doing. Find a gist to our talk here. During lunch time we watched a talk by Robert Virding about language design. planning our work on a new feature to show location on an open street map. We were figuring out how the architecture of the diaspora frontend works, where we have to put our code and from where we get the appropriate data. P.S. : we did our planning via post-its but we were looking for a free tool to build flowcharts digitally via twitter. We got so many suggestions <3 and started working with draw.io which also allows working collaboratively on a document! Our main goal was to substitute "before blocks" with "let statements" when instance variables should be created: http://betterspecs.org/#let But we found other things to improve along the way. In the evening we met our coach Andy to go through our work of the day and discuss about open questions. Since we are now so much into Rspec refactoring we decided to take existing tests to refactor them :-) We were pretty much inspired by betterspecs.org. Besides we got another coach. Yay! Btw it's so nice to have all these nice and helpful people around us. Day 8 - First Pull Request! Yesterday evening we met with our coach Andy and he helped us greatly with our very first diaspora issue by explaining us the proper use of Rspec in context of our changes. After attending "TechFriday" (watching interesting Conference Videos while eating lunch) we continued work on our issue and quickly stumbled into .to_json Date formatting problems. But at the end of the Day we made our very first pull request! This weekend Julia is super exited to learn some functional programming at the Clojure Beginners Workshop! Realizing that our dev environment we set up via vagrant is veeeery slow we decided to set up another local dev environment together with Christophe. While waiting for bundles installing and things compiling we learned more about the diaspora processes. We finally found a small issue to work on that was not yet taken (like many many before) or somehow very complicated (like most of them) and started working on it. The topic: adding a field to the export of user data. Furthermore there was a meeting at blacklane with the whole company where new colleagues and guests were introduced. So were we. 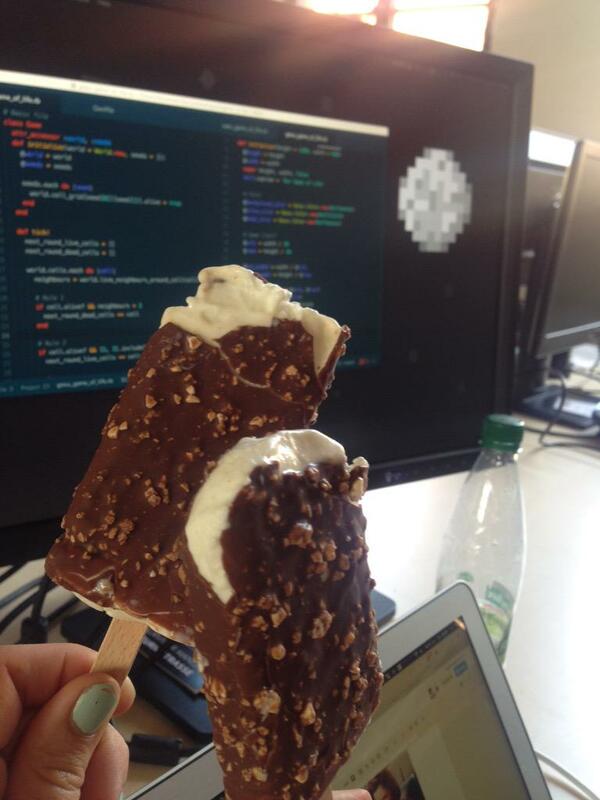 And we not only presented shortly ourselves but also awesome Summer of Code! Also Maren published an article on learning to code (in german). Now we are up to meet our coach Andy. * we also watched the video "The power of abstraction" by Barbara Liskov - great woman, very interesting topic though we didn't understand everything :) AND by the way: www.infoq.com/presentations/ seems to be a great resource of tech talks. Our day was pretty exiting since we moved to our second working space @blacklane. We got to know the development team in a weekly stand up meeting and had lunch with 4 of them (eating south indian food and talking about summer of code and science fiction movies). Finally we finished out Game of life and had to struggle a little bit with outdated code in the tutorial. But now IT WORKS!!!! You can see our code here. This was our hottest day so far 34°C in Berlin. Today we started building the Game of Life in ruby based on these tutorials. Based on this orignial tutorial. More about the Game of Life (which is a pretty interesting model) here on wikipedia. We learned a lot about test driven development and rspec and how rspec changed over the last few years (since the tutorial was a little outdated).